Provo, Utah – June 17, 2013 – Fastway Trailer Products introduces a tethered ball cover that keeps grease on the ball and off of clothes. 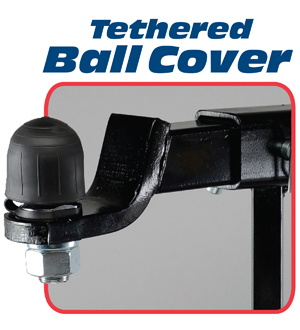 Unlike other ball covers, the Fastway tethered ball cover conveniently stays with the hitch ball while towing and is ready to use when it’s time to store the trailer. The Fastway tethered ball cover makes storing a trailer faster and easier. Two different models are available: one for a 2″ ball, and one for a 2-5/16″ ball. The new Fastway tethered ball cover is currently available through dealerships serving the towing industry throughout the United States and Canada.